SIT technology is available for investment / licensing. SIT is an original technology invented and widely patented by CODA Development. SIT is a versatile technology offering numerouous applications. While INTEGRATED SIT will be made an integral part of tire during manufacturing, RETROFIT SIT is a stand-alone aftermarket product retrofittable to regular tires, and delivering the same inflation and pressure maintenance functionality. Properly inflated tires increase car stability and reduce the danger of blowouts. They also ensure a car’s proper braking distance and overall vehicle handling and manoeuvrability. Correct tire pressure leads to lower rolling resistance, significantly improving fuel efficiency. Proper inflation considerably improves a tire's lifespan. Less carbon dioxide is released into the atmosphere. Less tire debris litters the roadways. Fewer scrap tires are generated. Drivers have confidence in knowing that their tires always operate at optimal air pressure. Elimination of tires inflating at gas stations, for an obviously easier and cleaner solution. SIT offers a significant added value to end consumers. Being among the first manufacturers offering self-inflating tires will be important for the new market dynamics. - Peristaltic tube chamber integrated into the tire wall. - Automatic pressure regulator with interface connecting the tire interior with outside environment. Production of SIT tires will be only marginally more expensive than the production of today’s regular tires. Low costs and a high added value create room for increase of profit margins. Tire pressure monitoring systems (TPMS) notify the driver when a tire is under-inflated. TPMS are already mandatory in the USA and EU. SIT addresses the core problem of tire under-inflation directly. It works independently, but also in combination with TPMS. SIT is an original technology, invented and patented by CODA Development Czech Republic. The technology is protected in the USA and Czech and Slovak Republics by 8 granted patents since 2009. The patent process for the Self Inflating Tire further continues with international applications submitted in the EU and 12 more countries including Japan, South Korea, India and China. Our continuously growing patent portfolio consists of more than 30 patent related documents (issued patents, pending patents and patent applications) covering 50 countries of the world. Independent patent analysis conducted in 2013 confirms that our patent portfolio is strong and enables unconstrained implementation of CODA's intellectual property. SIT uses the energy of the wheel to self-inflate the tire as needed. SIT uses the energy of the wheel to self-inflate the tire as needed. Keeping the tire always at its optimum pressure level. How does it inflate the tire? SIT uses the energy of the wheel to self-inflate the tire as needed, keeping the tire always at its optimum pressure level. The system integrates a peristaltic tube chamber into the tire wall. The chamber is kept closed at its lowest point by normal tire deformation caused by the vehicles weight. As the tire rolls against the road, the closure moves along the peristaltic tube chamber forcing more air into the tire with each wheel revolution. When a vehicle equipped with SIT tires is put in motion, under-inflated tires will automatically re-inflate to their optimal operation pressure, which the system constantly maintains while the tires are in use. The clever SIT design is extremely simple, consisting only of two new tire components - the peristaltic tube chamber and an automatic pressure regulator with interface connecting the tire interior with outside environment. Inflation is activated only when the tire pressure falls below its optimal level. When the optimal tire pressure is reached, the automatic pressure regulator disables the intake of atmospheric air and activates continuous internal air circulation between the tire and the peristaltic chamber. This is important as it takes the load of the system while it is not required to pump the tire, i.e. when the tire is properly inflated, which is almost in 100% of the time. As a result, SIT tires will always operate at optimal pressure. Driving for 1 km will compensate for typical monthly leakage of 2-3%. 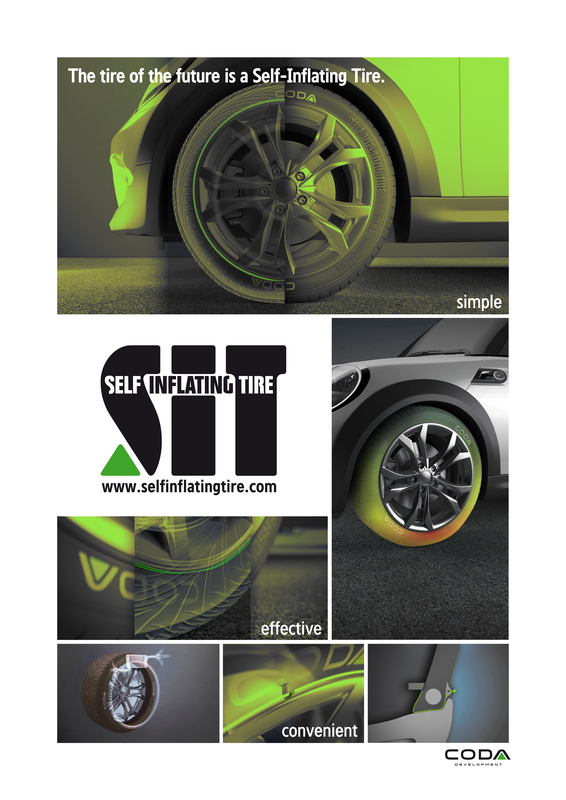 SIT – the Self Inflating Tire won the prestigious Tire Technology of the Year award at the Tire Technology Awards for Innovation and Excellence 2009, which were presented at the Tire Technology Expo in Hamburg, Germany. During its first public presentation the SIT technology won the AEI Technology Award at the 2008 SAE World Congress in Detroit, USA. Coda Development,s.r.o. vs Goodyear Tire & Rubber Company. Trade secret and patent claims charges over Self-Inflating Tires revived by the Federal Circuit. On 22 February 2019, the District of Columbia US Federal Court of Appeal reversed a trial court’s decision to dismiss Coda’s claims against Goodyear Tire & Rubber Company for misappropriation of trade secrets and failure to identify the true inventors on Goodyear patents. The appellate court remanded the case to the trial court for consideration on the merits. Coda welcomes the court decision and looks forward to an eventual decision on the merits of its claims. Coda also will continue its efforts to bring this game-changing technology to the market. What have our tests proven? Regular tire deformation enables implementation of a peristaltic pump into the tire sidewall. The inflation capability doesn't depend on the speed of the vehicle. The peristaltic tube integrated with the tire sidewall and the regulator is easy to produce with marginal extra production costs.